Why should I book with Event USA? One word: experience. Event USA has served Green Bay fans since 1989! Our on-site staff is experienced, friendly and helpful. We will be at your service every step of the way! Simply stated, our packages offer the highest quality at competitive prices! Want to read more? See actual testimonials from previous customers or view more reasons to Buy From Us. Who can purchase an Event USA package? Any individual or group can attend a game. Our bookings range from 1 person to groups of hundreds. I ordered on < date > & still haven’t received my tickets!? If you choose to have your tickets tour documents shipped with exact ticket locations purchased, they will arrive approximately 1 week prior to the game by FedEx. For those customers that purchased a package with generic seating locations, your package will arrive two business days before the scheduled game. For example, on a Sunday game, that would mean FedEx will deliver your package on Thursday. If you are leaving to travel to GreenBay before the scheduled shipping date we recommend changing your order to an office pickup-it’s FREE and one less thing to worry about bringing along for your trip! All packages and tickets can be picked up in our office starting on the Friday of your game weekend. How do you obtain tickets to Lambeau Field games? We obtain tickets from season ticket holders at market prices. Tickets are not available through the team as the stadium capacity goes to the season ticket holders with over 60,000 names on the waiting list. Will we sit together at the game? Generally, yes. In groups over 4 we try our best to have your group sit together and are usually successful as we have access to some limited large blocks of tickets for many of the Lambeau Field games. In the event we cannot get all your seats together you may be split up and seated as close as possible. To guarantee your group will be seated together we recommend upgrading to exact tickets. Group seating is more limited for road games. You will usually be notified at the time of order regarding the ability to seat your group together. Can we upgrade our tickets? Upgraded tickets, from the goal line to mid-field are available for most games. Club Seats & Skyboxes are also available for all home games. Can we purchase tickets only? You can purchase tickets without any other amenities here: tickets only. What are your office hours and where are you located? Please see our About Us page for current office hours, which also shows any extended hours for Home Game Weekends. 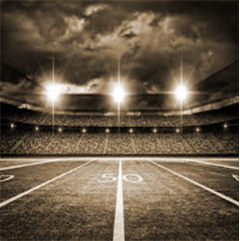 Our office is located just 1 mile from Lambeau Field in Green Bay, Wisconsin. The address is 580 Cormier Road, Green Bay WI 54304. Where can I purchase Packers memorabilia? We have Packers memorabilia and souvenirs for sale in our lobby or on display the day before the game in the lobby of the Tundra Lodge Resort. Check out The Vault! How do I get to Green Bay? For driving directions to and from various places of interest in Green Bay, get driving directions with our new tool. American, Delta, and United Airlines provide service to Austin Straubel Field in Green Bay. Can we extend our stay? Where can we meet players? Event USA offers our exclusive Gold Package which includes autograph and photo sessions with Players. Do we need to rent a car in Green Bay? With most hotels we use for our packages, a rental car is not required, but may be desired. All hotels included in our packages are either within walking distance of the stadium, or we provide you with transfers from the hotel, and many also provide airport shuttles. Local cab fares are relatively inexpensive and may be arranged through the hotel upon arrival. A rental car would be recommended for longer stays or to visit attractions outside of the city limits. Do you offer customized tours? Yes, all of our tours are available to fans from any destination. All tours include a 1 or 2 night hotel stay. Customized packages are available by adding airfare and additional nights hotel to the base package. To make flight reservations for any home or road game give us a ring at 920-722-5377. What is there to do in Green Bay? Green Bay is an exciting place to be on Home game weekends. There are many fine restaurants, sports bars and themed attractions. There is a zoo, the National Railroad Museum, and of course, you don’t want to miss the Hall of Fame at Lambeau Field. For a complete list of area attractions visit the Green Bay Chamber of Commerce or Green Bay Visitor and Convention Bureau web pages. What are the stadium policies at Lambeau Field? City Ordinance provides that no beverages, thermoses, ice chests, coolers or jugs be brought on the premises. In addition no food items and glass containers are allowed to be brought inside Lambeau Field. Video cameras and still cameras with lenses over 12″ are not allowed. You are permitted to use a still photo camera for your personal enjoyment. All game attendees, including infants, must have a game ticket. Where will my tickets be located? The standard Tour and Tailgate packages include an upper-end zone game ticket. Upgraded tickets from 100 level endzone to mid-field and club seating are available for ALL games at additional cost. I bought a package on < date > and I see the package is lower than what I paid. Can I get the difference? Sorry, no. Ticket prices can change many times before the start of the game, often multiple times per week or even per day! Likewise, we don’t ask you to pay the difference when prices rise. Unlike in department stores where merchandise has a relatively fixed price and may drop over time, tickets are like commodities where the price you pay varies depending on market conditions. We try to keep our prices relatively fixed over time but due to supply and demand as well as how the team is doing, we may need to adjust pricing accordingly. We always advise buying early which guarantees your place in the stadium, at the location you chose; if you wait, those particular seats may not be available any longer especially with the most popular games. This fee helps us recover some of the costs associated with processing payments, handling, as well as making sure all the tickets we receive are authentic. The processing fee is a modest 3% (other sellers have been known to charge 10% or more). While others may claim they don’t charge any service fees, the fee may actually be built into the price anyway.